In 1980 Sichuan archeologists started to excavate a walled city about 40 km north of Chengdu, at a place called Sanxingdui. What they found revolutionized many people’s ideas of ancient China. People had thought that the Shang Dynasty, which presided around the middle Yellow River, was the one great bastion of Chinese civilization around 1200 BCE. But the Sanxingdui site and excavations in other parts of China have greatly expanded people’s views of ancient China. Robert Bagley concluded that China at that time was larger, more diverse and more interconnected than scholars had realized. Come and explore one of the most interesting sites. The Sanxingdui site was a city surrounded by a wall 1.6 to 2 km from east to west, and 2 km from north to south. It was a rammed earth (hangtu) wall–a pan-Chinese construction method with deep cultural roots. This city was as big as the largest Shang urban settlements. 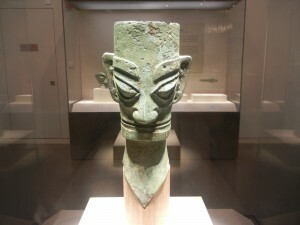 The Sanxingdui culture was no provincial outpost. It was the political center of the Chengdu Plain–a very fertile region in southwestern China. 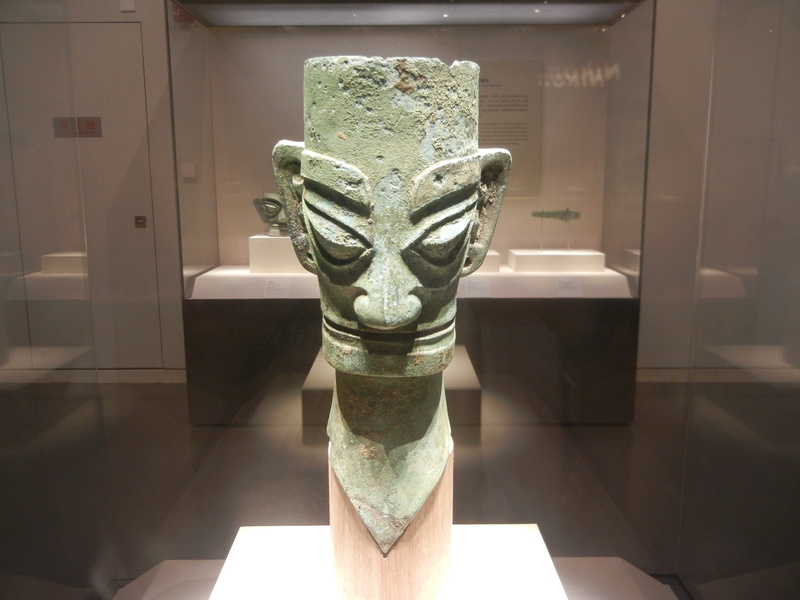 The Sanxingdui culture fashioned many statues and masks with prominent faces. What did they use them for? Were they tomb guards, like the terra-cotta army near Xi’an, which Qin Shihuang created about 1,000 years later? 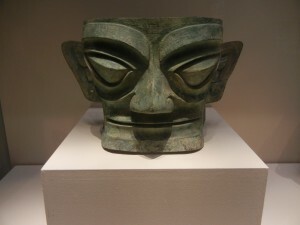 Enormous eyes and ears are two of the most common features of these figures–the eyes of the mask pictured below protrude. But several bronze’s faces are covered in gold. One wears a crown or garland around his head. So some of the figures seem too aristocratic to be guards. And many are smiling–you don’t expect guards to have a good time while on the job. Were they supposed to be gods, or shamans helping a departed ruler’s spirit rise to Heaven? Or were they stylized portraits of elites? Ancient Nigerian cultures like the Nok and the Yoruba made large bronze sculptures of elites, with some features exaggerated to project their dignity. Theories abound, but nobody really knows what the Sanxingdui bronzes were for. Writing wasn’t used in Sichuan until the 3rd century BCE. But the Sanxingdui figures project confidence and power that are more stately than menacing. 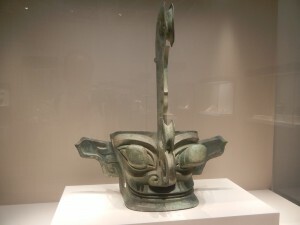 The Sanxingdui culture also made large bronze trees. Their branches are full of birds and pendants. The Sanxingdui site was abandoned around 1000 BCE, possibly because of flooding. Chengdu was growing, and newer cultures emerged. Sichuan art flowered again in the late first millennium BCE, and it again had these 2 characteristics–humanism and a love of nature. Sichuan’s abundant soils, beautiful mountains and mild climate must have allowed people to enjoy life. Though bronze-casting spread from the Shang cities, Sichuan used it according to its own view of the world. China around 1200 BCE consisted of many states which traded technologies and ideas. They had common features, like hangtu walls and palaces, artistic motifs that stress energies that flow in holistic patterns, and the use of large bronzes to express political centralization. But different states created their own patterns. Archeologists are still discovering how rich and complex ancient China was. Watch this field with eyes as big as the Sanxingdui statues’.